This presentation shows how cost effective and easy it is to operate the system's electronic UTxx for various kind of applications. The system is quickly adaptable for all kind of applications using a variety of FIRMWARE. This makes the system flexible. The system's flexibility and easy handling is demonstrated through our experience with examples such as 'full body tube inspection', 'ERW inspection & deburring check' and 'bar testing'. In modern, tailor made test systems, the PC plays a more and more important role, not only for handling of the test specific requirements, but also to make use of sophisticated features being offered as a wide spread product being used as a consumer product. A system, in general terms, consists of a mechanical system, UT- instrumentation, and data acquisition equipment. Due to the availability of highly sophisticated and economic software packages, the architecture of NDT- systems has changed to make preferred use of the features of generally available, finished software packages. Even though the user may not see the difference between a buffered and a non- buffered real- time system, data may be lost and thus no reliable operation at high pulse repetition rates may be guaranteed. One way to provide a buffer is the integration of a digital signal processor for the NDT-equipment. In the following, examples are presented which show the integration of useful features at low cost using commercially available software. 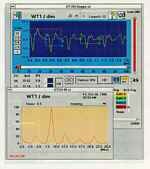 This software package is especially dedicated to measurement system applications. In the present case of parameter setting and control of an ultrasonic system, the gates and thresholds can be set within the oscilloscope and thus allow easy and self explaining operation without need for time consuming training on the system. In the lower window, an additional feature of LabView has been applied, namely the direct furier transform of the A- scan above, which allows easy and convenient check of the status of the system. Above window is part of a software customized to specific user requirements. The software stores strip chart records as well as results per length section and allows storage and off-line analysis of the whole production. Further, links to the CAQ- mainframe can be provided to allow complete, easy and low cost meeting of quality control requirements, including ISO 9000- demands. Today, software is available, which allows access to a WINDOWS- based computer systems from a remote position via a phone modem. 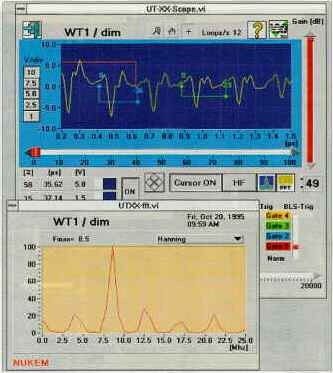 Establishing a modem- link and using such tool, an NDT- system can be operated e.g. from the supplier's facilities and can so give extremely fast and easy trouble shooting support all over the world.